What cleans your hands, is pretty, and smells nice? It's not a trick question -- it's Dial Deep Cleansing Hand Soap. This is a premium soap with refreshing moisture, and it also has micro-scrubber. I remember when my Dad would come home from work he would need to scrub his hands, and back then he often had to use powdered soap. I wish Dial would have made this soap back then for him to wash away his work day -- and even though it's scented, it's not a girly scent so it's a great family soap. Plus it moisturizes! In fact, when my boyfriend smelled the Yellow Raspberry scent, he commented, "That smells great!" Dial Deep Cleansing Hand Soap comes in three varieties. I was able to try "Water Blossom" and "Yellow Raspberry with Black Sugar". I can't wait to try "Coconut Lime Verbena". Dial is a quality product and I remember my mother telling me that was the only soap I was to buy when I started grocery shopping for the family. I'm excited to see a new product to their line. I'd like to win because I enjoy trying new products. I love dial hand soap! I'm always washing my hands and I really like Dial products. I'm always up for trying new Dial goodies! I like to try new products . I'd like to try this because Dial is a good soap and would like to try the scents. I would like to try this because I want a new hand soap cause my other one is making my hands very dry! i'm low on hand soap and would love to try this to see if i want to stay with it. I would like to win because we use a lot of body wash at my house. 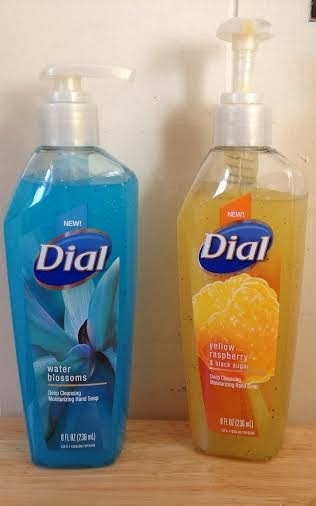 I would also like to try the new Dial Scents. Everything else I try makes my hands feel dry. I would like to see if this differs. I would like to win because I like Dial products, and I also like trying new products. I would like to try these!! I'd like to try the different scents. I love Dial Products, including these soaps! Because dial products are great! I would like to win this as I love Dial products. I'd like to win to try something new.